The NGFW is the first line of defense to protect against today’s evolving threats and is a critical component of any defense-in-depth strategy. The NSS Labs NGFW test methodology has evolved from the previous testing to reflect the threat landscape and therefore, this latest testing includes SSL inspection. This is an important key test factor because most vendors see huge performance impacts when SSL is turned on, preventing them from publishing SSL performance on their datasheets. With the expanded use of secure sockets layer (SSL)/transport layer security (TLS) in the traffic traversing the modern network, an NGFW must be able to inspect encrypted content. NSS Labs evaluated firewall products with 190 different evasion techniques, more than 2,000 exploit tests and throughput tests. 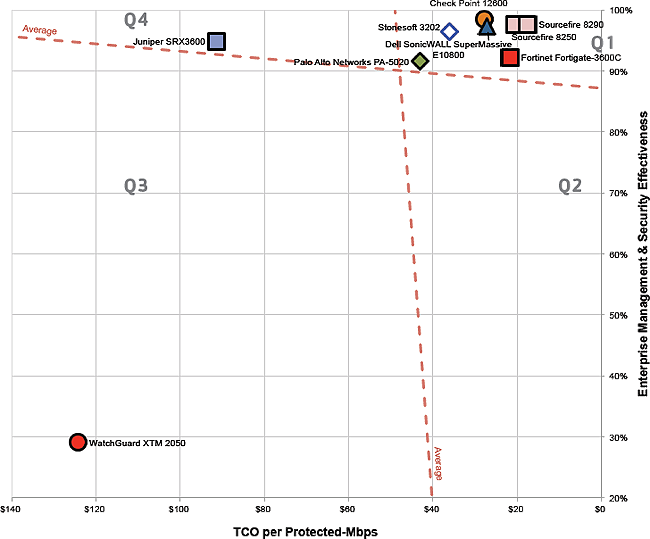 NSS Labs regularly released NGFW Security Value Map™, Comparative Analysis Reports, and Product Analysis Reports. These results help guide security professionals in the enterprise to make informed decisions when evaluating the many offerings in the industry. 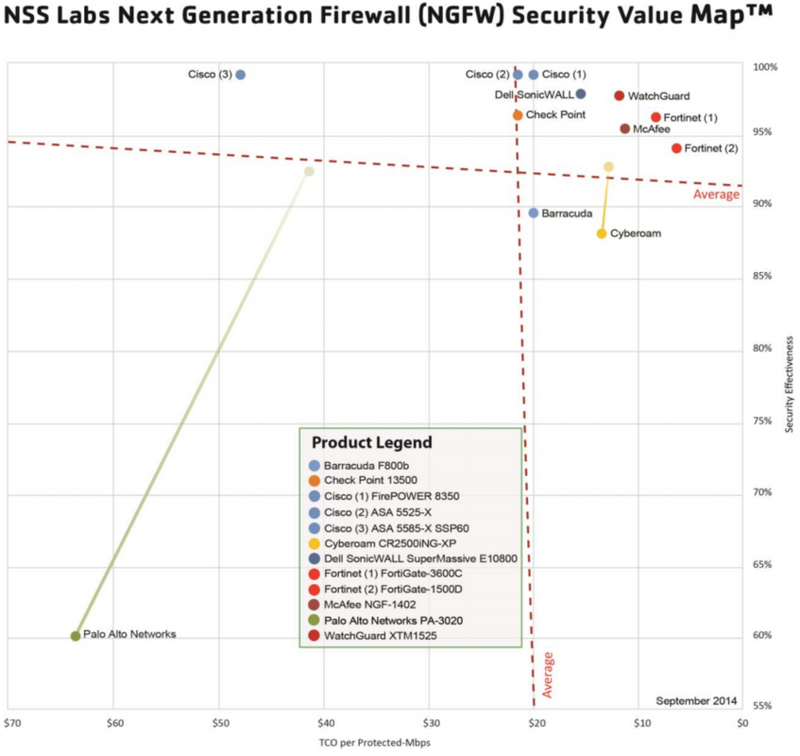 June 06, 2017 (GLOBE NEWSWIRE) -- NSS Labs, Inc., the global leader in operationalizing cybersecurity, announced the results of its Next Generation Firewall (NGFW) Group Test. 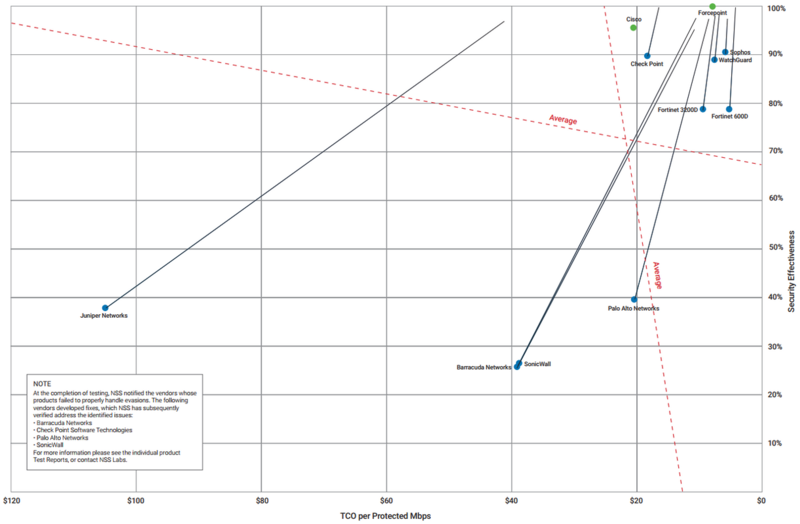 TCO per Protected Mbps ranged from US$5 to US$105, with most tested products costing less than US$22 per protected Mbps. The average Security Effectiveness rating was 67.3%; seven of the tested products received an above-average Security Effectiveness rating, and four of the tested products received a below-average Security Effectiveness rating. 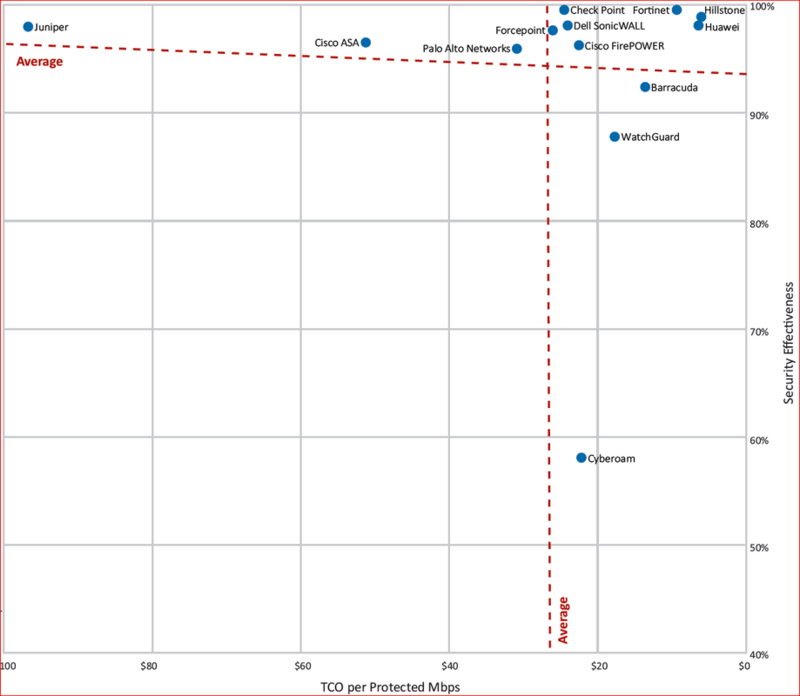 The average TCO per Protected Mbps was US$25.2; eight of the tested products were rated as having above- average value, and three of the tested products were rated as having below-average value. Check Point® Software Technologies Ltd. (NASDAQ: CHKP) today announced the company received its eleventh ‘Recommended’ rating from NSS Labs. Check Point’s latest results earned its fifth ‘Recommended’ rating in the NSS Labs Next Generation Firewall Test, delivering top results with the highest block rate (99.8%) from the NSS Labs Exploit Library and tied for the highest security effectiveness score (99.6%). 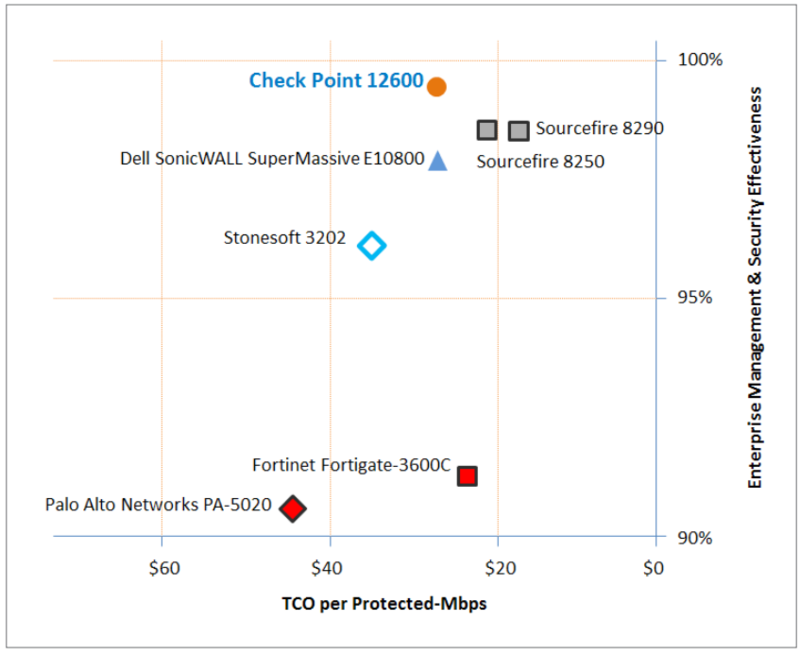 Hillstone Networks Next-Generation Firewall's high marks include lowest for Total Cost of Ownership (TCO) per Protected Mbps, blocking 99.6% of exploits from the NSS exploit library and blocking 98.32% of live exploits over a 2-month period from December 1, 2015 – January 31, 2016. NSS Labs said the Palo Alto PA-3020 Appliance passed stability and reliability tests, and enforced firewall policies. It also correctly enforced complex outbound and inbound policies, the firm said. The appliance fell short in detecting evasion measures often used by attackers to bypass firewalls. 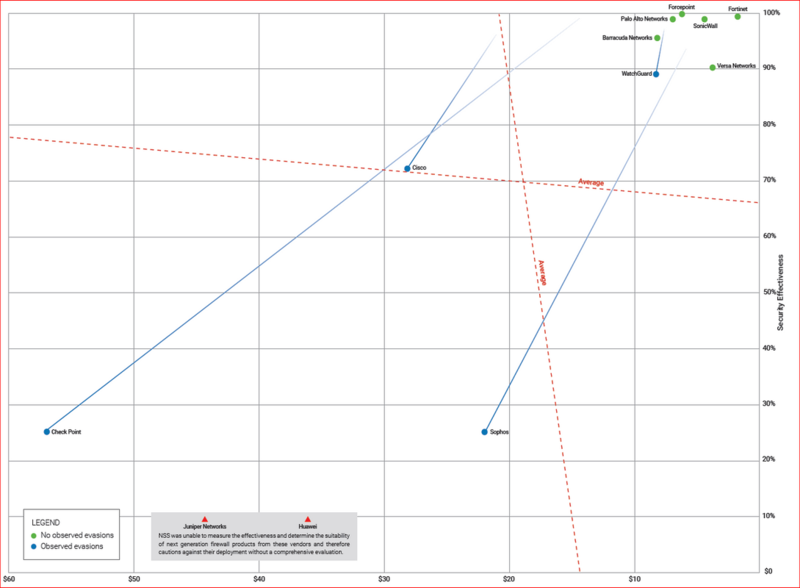 Using RPC and IP Fragmentation attacks, NSS Labs was able to conduct a bypass. The appliance also took a performance hit, earning a 719-Mbps rating while the vendor claimed 1-Gbps performance. WatchGuard's XTM 2050 appliance got poor marks and earned a caution designation after it fell well below competitors.